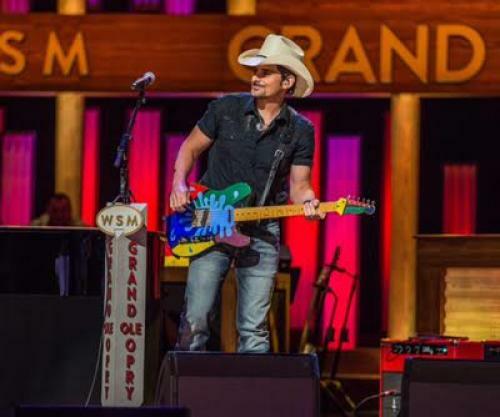 Country superstar Brad Paisley performed his current single, "Today," for the first time anywhere on the Grand Ole Opry this past Saturday evening, as part of the Opry's 91st Birthday Celebration. "I couldn't think of a better place to perform this song for the first time," said Paisley. "I love this place more than anywhere in the world....The greatest moment of my career was when my friends Bill Anderson, Jimmy Dickens and Jeannie Seely invited me to be a member here." The large video screen on stage then showed the actual invitation from his friends and then Paisley started singing "Today." The video that continued on the screen was created by Paisley and showed highlights of the Opry's most significant and poignant moments from the past to present. The music video for "Today" was released Thursday via Paisley's Facebook page and has garnered over 18 million views to date. View the emotional video HERE. Co-produced by Paisley and Luke Wooten, this powerful song was co-written by Brad Paisley, Chris DuBois and Ashley Gorley. "Today" will be featured on the world-renowned entertainer's forthcoming studio album, his 11th release on Arista Nashville.